If you have been reading this blog for a while you know that I am always daydreaming about life in countries all around the world. I’m really not picky. Well… I do think about safety more than I used to, but I think that is actually pretty common for many teachers! Internations and HSBC have recently published reports about the best places to live as an Expat and I just had to see how they matched with my own LONG list. 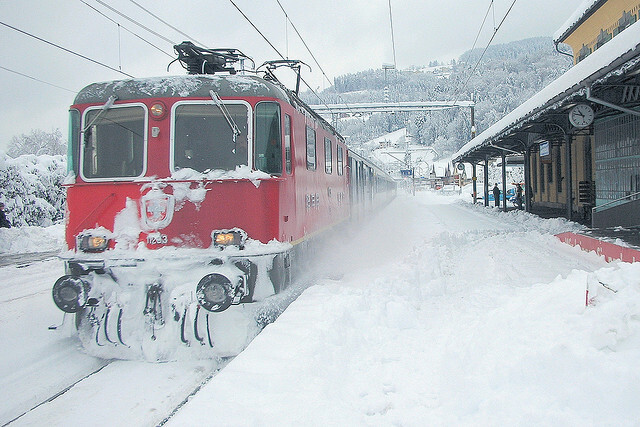 Switzerland: I have looked into Switzerland and there are some great international schools there, but I’m not ready to give up living in a warm environment yet. Singapore: I’ve already looked into schools here and I’ve heard that the work/life balance isn’t the best. China: I would definitely move back if it meant working in Shanghai. Germany: I would love to live here but the taxes would break me if I didn’t already have all of my student debt paid off. Bahrain: I never really looked into this country! Will definitely check it out now! New Zealand: I haven’t seen many prospects for international teachers, but it looks beautiful. Thailand: Definitely at the top of my list of places I want to live. Taiwan: I am considering this country more and more! India: The American School of Bombay sounds fantastic. Hong Kong: I’ve only heard good things about this country. Oman: I don’t know of anyone who has worked here, but I’ve heard that there are some fun outdoorsy options for downtime. Qatar: I have friends teaching here and they seem to like it. Vietnam: I have a friend who raves about Vietnam and it is now on my radar! Ecuador: I hope to visit next year, but I have friends who taught there and they weren’t huge fans of some recent educational policies that went into effect. Luxemburg: I met one girl who managed to wrangle a job at an international school there and she loved her experience. Mexico: I’ve heard good things about the international school in Monterrey, but I would love to teach anywhere there that paid me well enough. I miss Mexico! USA: I don’t plan on working on the US anytime in the foreseeable future. Spain: I would love to work here if my student loans were paid off! Philippines: This country is showing up more and more on retirement lists, but the International School of Manila is one of the top schools in the world. Australia: I haven’t found many international school prospects here. I’m glad you liked my post! I would love to work at either of those schools (well only at ISB if they hooked their teachers up with some POWERFUL air purifiers!). Yeah, even when I was there 94-96, the air was pretty bad. But now… I recently read on CNN they have a hi-tech dome now, so the kids can play inside. It cost around $5 million to build it! Thanks for the info. That hi-tech dome sounds awesome! I have never heard of anything like that Juwon! When I lived in Beijing I didn’t have an air purifier (just a few plants that were slowly dying) in my apartment and I always felt sick (coughing, scratchy throat, burning eyes, headachy). I remember seeing the smog in the hallways at the international school I taught at. We needed a dome! Definitely Switzerland! Beautiful, safe, good economy everything you could ask for! Great post. Cheers! I totally agree! While I have never been to Australia, I have heard so many great things about it. Also, I have never met an Australian I didn’t like! I have heard of a couple international teachers who have managed to find long term positions in the Outback, but I don’t think that is the lifestyle for me. I would love to find a teaching job in a major city though! interesting links; One thing I can tell you: Take the lists with a grain of salt; InterNations has a vested financial interest in getting your business. HSBC will always use economics as a factor which shoudl not be the top consideration on your list. We have no kids and you are single so rule out anything that takes kids into the picture. Others will tell you differently but personally Diane and I think any single woman living in a Muslim nation with strict religious views are crazy so I’m unsure why the’d list Oman , Bharain or any country that treats women as second class citizens (at best) but that’s just our opinion. Good luck and have fun in teh future !! I mostly think that these lists are just for fun. I really liked playing around with the different parameters and seeing what results would come up. 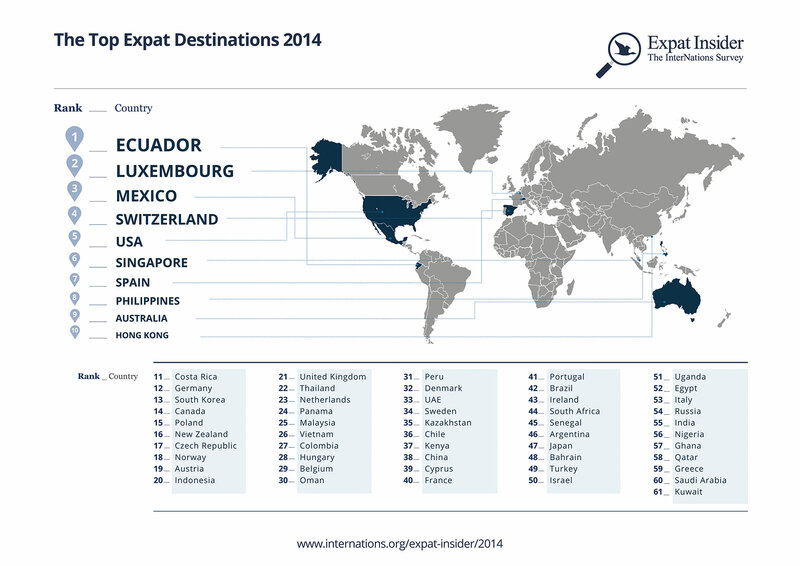 I was also surprised that Malaysia wasn’t on this list! As to working in difficult countries, I think it is a little different for international school teachers. Most of the schools that I have worked for are really good about creating a comprehensive orientation program and providing support for teachers throughout the time we are in the host country. Usually if we have any problems with utilities or our apartments they are handled by the school. Also, when the school isn’t up to par, usually the teachers band together to help out one another. Sometimes parents are also really supportive. For example, my school in China wasn’t so helpful, so one time a mom from my classroom took me to the place I needed to go to to pay for my gas bill AND she wrote me a note in Chinese saying what I needed. I think the support system available for international teachers makes me feel comfortable enough to teach in almost any country. Glad to hear about the support system but as a white guy married to a Chinese woman I at first I was surprised about your story in China. But then I thought about it and realized that it’s typical for Chinese people to do whatever it takes that will allow their kids a good shot at making money. They understand education is the best chance at prosperity. Would you still be comfortable in a country that limits where women can go? Diane even hated Singapore because she had to wait outside while I visited a mosque in the Arab quarter. That is an excellent question! I’ve asked myself the same thing, “If I were offered a job with Saudi Aramco (one of the highest paying jobs on the international teaching scene), would I take it?” I used to say that I only would if I were married with children, but after teaching in Venezuela where life can be a more than a little stressful (see https://teachingwanderlust.com/2014/10/10/how-i-ended-up-with-a-gun-pointed-at-my-face/), it might be nice to live in a gated community in a country with very little crime. While I wouldn’t choose to retire in one of these “difficult” countries, I think I could easily work for 2-6 years in the right environment. Interesting reply. One reason we chose Malaysia (or Thailand if that doesn’t work out) is the ability to NOT live in walled off from the local culture. There’s no crime because the penalties are so severe but for us, living among other expats and never immersing with others would be like prison. But I see your point also and it;s not like you need to stay somewhere forever.